Rachel began her career in private practice with Racine Olson in 2013. 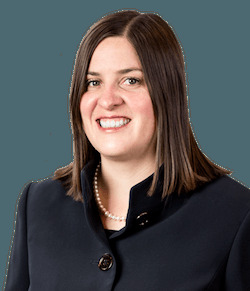 Rachel’s love of learning originally led her to a teaching and coaching career path, but ultimately led her to study and practice law where there is always opportunity to learn more. Consequently, Rachel practices law with a teacher-learner focus. Rachel listens carefully to her clients to learn their needs, and then helps educate them about their legal options. Rachel is able to use her education training to persuade her audience about the law as she advocates for her clients to obtain their goals. Rachel previously clerked for the Honorable Mitchell W. Brown and the Honorable Stephen S. Dunn from 2011 through 2013. Clerking for two district judges provided Rachel with invaluable insight into the judicial decision making process as she drafted legal opinions, jury instructions and orders on a daily basis.